We present a method for synthesizing animations of autonomous space, water, and land-based vehicles in games or other interactive simulations. Controlling the motion of such vehicles to achieve a desirable behavior is difficult due to the constraints imposed by the system dynamics. We combine real-time path planning and a simplified physics model to automatically compute control actions to drive a vehicle from an input state to desirable output states based on a behavior cost function. 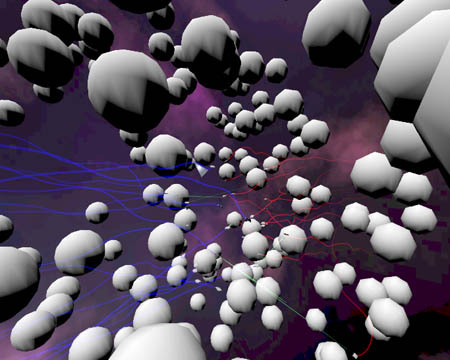 Both offline trajectory preprocessing and online search are used to build an animation framework suitable for interactive vehicle simulations. We demonstrate synthesized animations of spacecraft performing a variety of autonomous behaviors, including Seek, Pursue, Avoid, Avoid Collision, and Flee. We also explore several enhancements to the basic planning algorithm and examine the resulting tradeoffs in runtime performance and quality of the generated motion. Jared Go, Thuc Vu, James J. Kuffner (2004). Autonomous Behaviors for Interactive Vehicle Animations. ACM SIGGRAPH / Eurographics Symposium on Computer Animation.